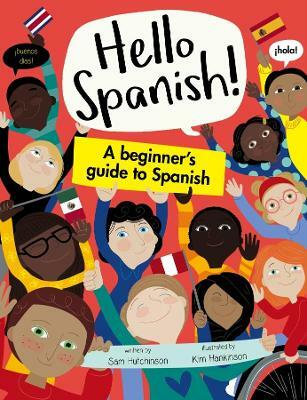 This is the perfect book to accompany school starters as they learn Spanish. Each expertly designed section encourages enthusiasm, builds confidence and gives young learners the basic Spanish skills they will need as they grow. Learning through clear, fun and familiar examples wi... read full description below. This title is no longer available locally, but in stock internationally – usually ships 2-3 weeks. This is the perfect book to accompany school starters as they learn Spanish. Each expertly designed section encourages enthusiasm, builds confidence and gives young learners the basic Spanish skills they will need as they grow. Learning through clear, fun and familiar examples will spark a lifelong passion for Spanish! Sam Hutchinson is an award-winning book publisher who studied French and Italian at university before joining b small publishing. In collaboration with former primary MFL teacher, Emilie Martin, Sam created the Hello Languages range of books for children to introduce them to a new language at home. Kim Hankinson is a designer and illustrator based between Brighton and London who helped developed the multi-award winning `This is Not a Maths Book' and has worked freelance for Egmont, Quarto, Buster Books and Lonely Planet Kids.